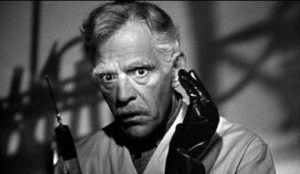 Before I Hang is a rather enjoyable Boris Karloff film, with a fine supporting cast, and a strong theme the allure of eternal life and a strong question: is murder in the blood? The film begins with the elderly Dr. John Garth, a scientist investigating a way to reverse the aging process and so extend the human life span. Unfortunately, before his research was complete, an elderly friends pain had become intolerable, and Dr. Garth committed murder a mercy killing. 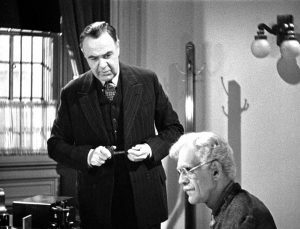 Dr Garth is sentenced to death by hanging in three weeks but in the interim, the warden of the prison (Ben Taggert) is permitting him to continue to his work, assisted by Dr. Ralph Howard (Edward Van Sloan, aka. Professor Van Helsing in Dracula, Dracula’s Daughter). They work day and night, and devise an experimental serum, using the blood of an executed prisoner, just before Dr. Garth’s execution. Since he’s about to be executed, and has nothing to lose, Dr. Garth is the first test subject. However, just as he’s about to be executed, his sentence is commuted to life in prison. However, the serum’s effects on Dr. Garth cause him to collapse. When he awakes, he finds that he has survived the treatment, and is now physically twenty years younger. Once recovered, the two scientists decide to continue their experiment, this time using Dr. Howard as the subject. However, Dr. Garth is overcome by homicidal urge and murders Dr. Howard instead. When a prisoner comes upon the scene, Dr. Garth murders him as well. Afterward, Dr. Garth has no memory of committing the murders, and prison officials decide that the prisoner murdered Dr. Howard, and attempted to kill Dr. Garth, who must have killed him in self-defense. This leads to Dr. Garth being hailed as a hero, and leads to a pardon from the governor, making him a free man. Dr. Garth returns home to his loving daughter, Martha (Evelyn Keyes Here Comes Mr. Jordan, The Jolson Story), and he decides to continue his research into the anti-aging serum. He contacts three of his elderly friends, and offers them the gift of youth but they refuse, at least initially. However, one of them is a pianist (Pedro de Cordoba), whose aging is making it difficult to perform and he agrees to the treatment. When Dr. Garth goes to his house to administer the treatment, he is again overcome by the homicidal urges of the executed prisoner, and murders his old friend. He goes to confess his guilt to another friend, but murders the man as he attempts to call for help. Martha Garth suspects that something is wrong with her father, and confronts him. Dr. Garth begs her to leave as he continues to fight the impulses of the murderous blood, but she refuses and he attacks her. She faints and Dr. Garth is able to flee, and spare her life. Dr. Garth, now being pursued by the police, approaches the prison where he had been incarcerated. The warden admits him, but Garth immediately makes aggressive movements toward the armed guard at the gate. The guard shoots him and the dying doctor confesses that he committed suicide in order to prevent himself from killing anyone else. In short, Before I Hang is a very enjoyable Boris Karloff film with a likable cast, thats all the more important in this film. Karloff is sympathetic figure, compelled to murder despite it being contrary to his will a loving father being compelled to murder his daughter. Likewise, his victims are likable people, making it all the more sad when their friend is compelled to murder him. The acting is fine, and the movie is quite good.